It has taken me a few days to collect my thoughts from what was an emotional conference for me. I found myself more viscerally affected than I expected from the dismal human rights reports from Malaysia, Kenya, South Africa, Poland, and other countries that are still stuck in the dark ages with atrocious and violent practices towards trans people and especially transwomen. Above all, I left the 5 days with a humble gratitude for my ciswoman privilege that I carry so casually, and the understanding that there is much more to learn. The #NOGIC conversation that dominated the conference was also charged with tensions between the liberal and conservative factions of WPATH. To summarize, the ICD 11 is being developed for 2018, and there is an opportunity to remove codes for what was previously called gender dysphoria and is now called gender incongruence of childhood (GIC) as a mental health diagnosis. Removing transgender from the mental health section depathologizes the fluid experience of childhood gender while allowing youth to still receive care under sexual health Q and Z ICD codes for insurance reimbursement. Removing the diagnosis removes the disease, in effect; removing the diagnosis of gender as a disease is compared to removing homosexuality as a disease, which was included in the ICD codes until alarmingly recently. 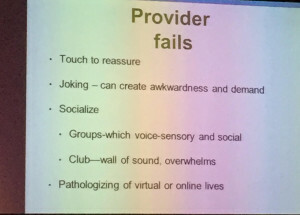 One presentation on the state of Trans health and Trans activism in Africa reinforced that having the GIC ICD code applied to youth increases the incidence of so-called reparative therapy and “corrective measures”, underlining the urgency to remove this diagnosis from a World Health perspective. 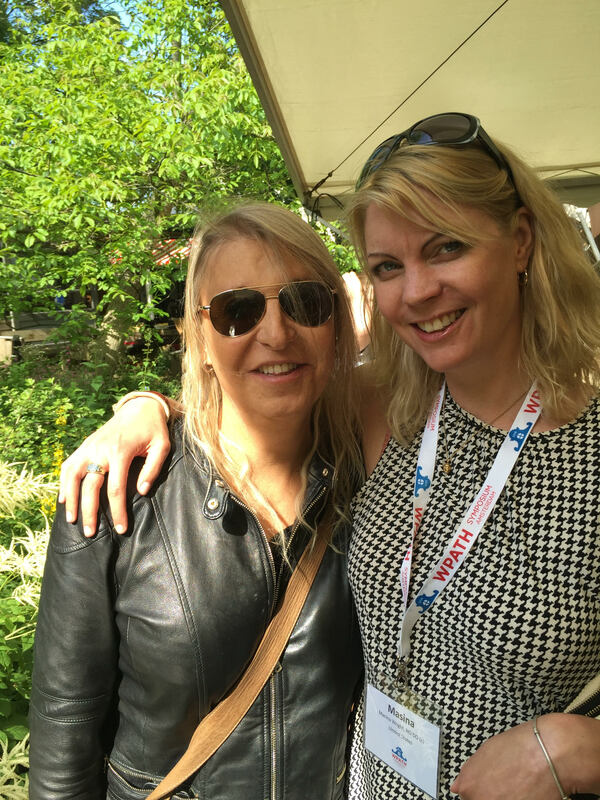 During the Plenary conference day, in which we all sat together in a conference hall at VU University, we heard from Valentine, a Dutch transwoman. 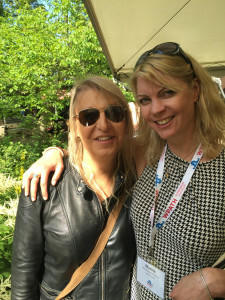 Although I cannot remember her exact words, what I heard was that the diagnosis of transgender from age 5 on created her identity for her: a medical identity that was reinforced by psychiatry, medical services, hormone treatment and surgery. Now, a beautiful woman and model at 26, she is starting to discover her personal identity apart from her assigned diagnosis and trans identity. The “Dutch Protocol”, which is one of the most evidence based transgender protocols in the world, has been up until very recently completely binary. Transgender is an acceptable state of being, but one still had to choose male or female in the end. The American and Canadian approach has been much more in line with our North American identity model which has room for great variance and personal expression of identity. 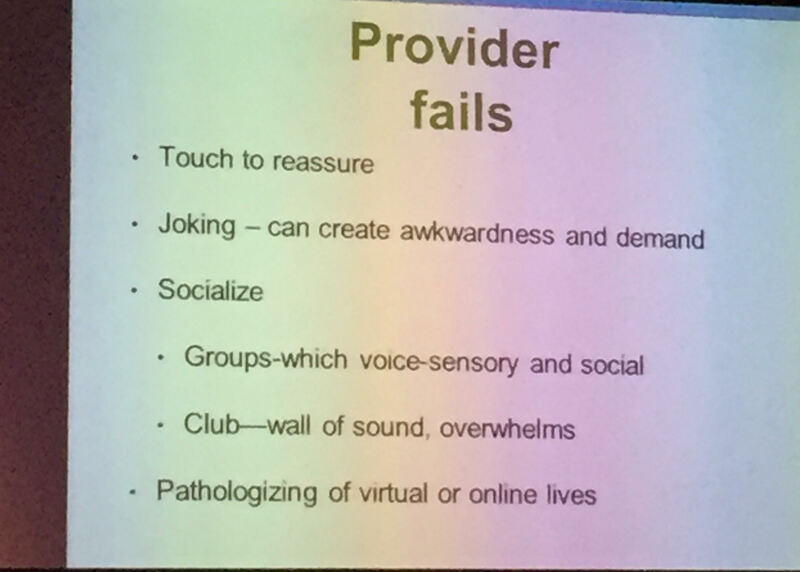 As a result, although the 2 gendered binary model of man/woman is still ubiquitous culturally, most of the care providers I talked to from North America were offering trans health in a framework that allowed for great difference of presentation, hormone use, and surgical intervention. This is perhaps most seen in the US where Sexual Reasignent Surgery (SRS) has just been approved by Medicaid and is inaccessible through most insurance plans. Therefore, the cost of hormone and surgical intervention makes it harder for many Trans Americans to access. The first day had an interesting “couch-style discussion” presentation I will likely return to in my mind many times during my career as a physician. We discussed 5 models of decision making in health care in small groups, then one member of each group went and represented the general consensus in a larger discussion. 1 was physician as gatekeeper, making all decisions and 5 was the patient as decision maker, taking only into account the patients knowledge of the treatment. 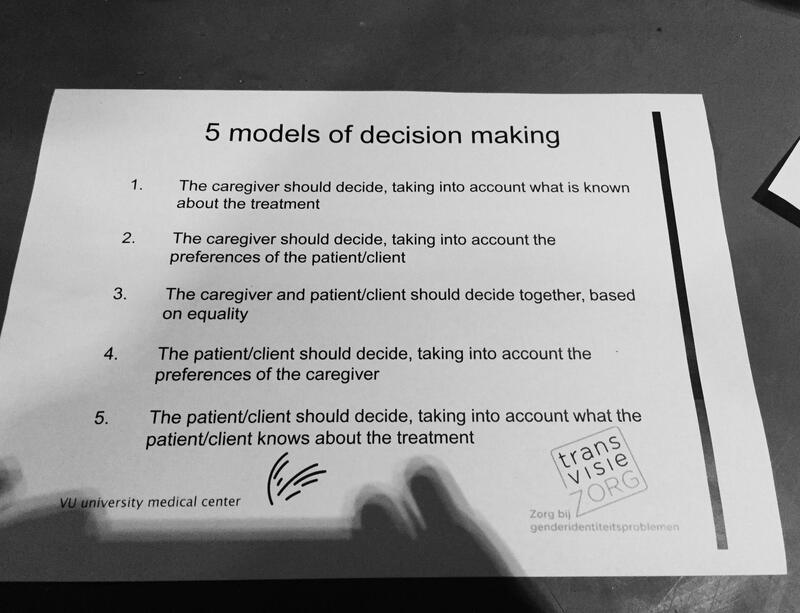 Most people in the room advocated the middle option of caregiver and patient making decisions together based on equality, and how this can play out in a clinical setting. There were many discussions on ethics, how the Dutch hospitals manage ethical decisions in this genre of medicine, and the politics and dynamics of informed consent within our current global health care models. The amount of information presented was staggering. There was a heavy emphasis on youth, perhaps because the care of our future generations has such an impact on the health of our individual nations. There is a statistically significant increase in autism spectrum disorder with gender variance being seen by people providing Gender Affirming Care. Thus, Autism 101 is essential for all medical providers working with in trans health to be able to provide competent and accessible care for all members of this community. Routine hysterectomy and oophorectomy are no longer indicated for transmale cancer prevention. According to evidence testosterone does not cause endometrial thickening. Ovaries may become more PCOS-like under the influence of high levels of androgens, but there is no evidence of increased ovarian cancer. 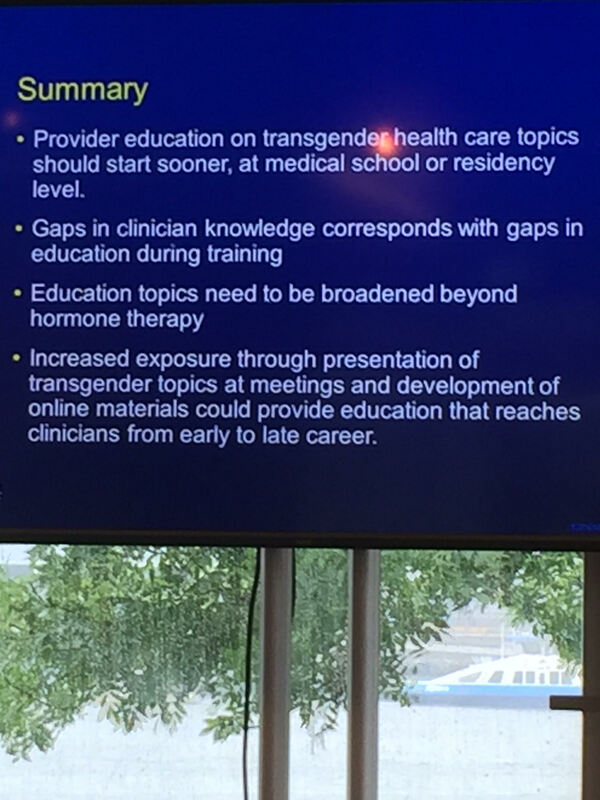 Endocrinologists want and need more training in Trans health. Up to 80% are already seeing trans patients without cultural competency for staff or self in place or accredited medical education. 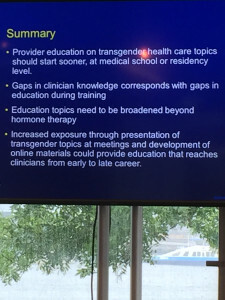 Surgical fellowships in transgender surgery are being developed, and the first pilot fellowship is in place with the Mayo Clinic this fall 2016. A beginning conversation about developing lab values specifically for transgender populations, and what that would entail. There was more information of course, but these are the pieces that stood out to me. I come to trans medicine with a Naturopathic and anti-aging bioidentical hormone perspective, and there was not one slip of information along those lines. The treatment paradigms remain extremely rigid in that approach, without much room, at least at this conference level, for discussion about treatment plans outside the evidence based parameters grandfathered in by the Dutch protocol. For example, in a discussion about progesterone and breast health there was disagreement about the use of bioidentical progesterone (or prometrium) to prevent breast cancer with estradiol use, a fact that I thought was common knowledge. I have spent the past 5 days in Amsterdam post-conference with my sweetheart, and every once in a while he catches me staring intently off into space, lost in a reflection about this conference. As I said above, I leave feeling like I know less than I arrived – a state of being apropos for a second year medical student and perhaps the best way to approach this field at a time when we can best learn by listening to our trans patients themselves.